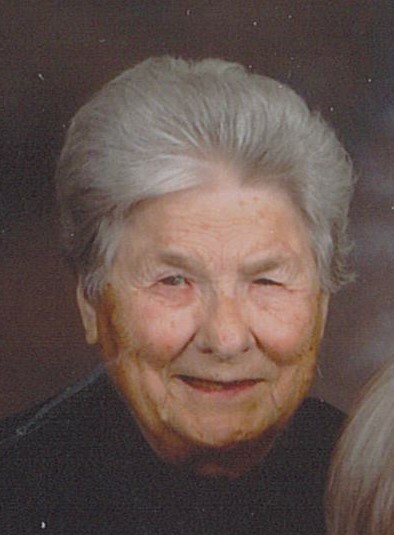 Esther Carolina Magdelene (Dietrich) Fieseler passed away peacefully on March 21, 2019 in the Langenburg Centennial Care Home at the age of 100. Esther was born February 4, 1919 to Margaret (Metz) and Philip Dietrich in the area of Landestreu, South of MacNutt, SK. She was baptized, confirmed and married in the Landestreu Church. She was the oldest daughter of eight children. The family moved to Dropmore, MB, where she attended school. Esther often shared stories about helping to raise her siblings, teaching them to sing, sitting in front of the oven door in the winter to keep warm and walking to school with her older brothers. They would carry their shoes and put them on once they got to school, so they wouldn’t wear them out. She would often say, “She grew up in the horse and buggy days.” Esther married Alfred Fieseler on July 28, 1937. They had two children: Bernie and Myrna. Esther worked as a housekeeper/nanny in a Doctor’s home after their marriage, while Alfred and her two eldest brothers went to Northern Ontario to work in forestry. When Alfred returned from Ontario, they purchased a Red & White store in Pipestone, MB. When the war broke out, they were ostracized from that community due to their German heritage and eventually moved to Langenburg SK where they bought Alfred’s family farm North of town. They raised their children there and eventually sold their farm, and moved into town in 1974. Esther worked as a janitor at Toronto Dominion bank for a number of years, as well as a nanny/housekeeper for the Maduke family. Those children became a very important part of her life and remained close to her right to the end. Esther loved summer because her grandchildren, Craig and Keri, would come from Edmonton to visit to take swimming lessons. Her favorite stories were about those times. Sometimes they would walk 3 times a day to Gopherville so her precious charges could jump on the trampoline. She remained devoted to them and they to her, sharing those stories right to the end. Esther loved to garden and grow beautiful flowers and was very proud that not a weed was allowed to grow. She was a sewer, teaching 4-H sewing to many young people over the years. She also taught many people in Langenburg how to quilt. It was one of her passions. Every member of her family has a quilt that is cherished because it was made by Esther from her heart. After the loss of her husband in 1996, she lived alone in their home until 2002 when she suggested her daughter, Myrna return to care for her. When her legs no longer supported her, she asked to reside at the Langenburg Care Home in 2015. There she would say, “They treat me pretty good here, the food is good”. I know she would want me to thank the ones who are dedicated to caring for those who can no longer look after themselves. It takes a special type of person to do that every day, quietly, efficiently and often without thank you. We were happy to have a small celebration for Esther’s 100th Birthday. She was surprised that she lived that long. She did not like a fuss being made and was quite reticent whenever any type of celebration was planned to honor her. Esther has left to mourn her two children, Bernie and his children: Darrell, Colleen and her daughter Haley, Robyn and her boys Jack and Evan; Myrna Pilon and her two children, Craig and Keri (Andy). She is also survived by brothers: Edgar (Pat) and Rueben (Ruth), sisters-in-law, Olive and Joyce Dietrich; and Agnes Fieseleras well as numerous nieces and nephews.